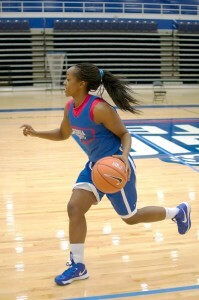 One of its newest members of the women’s basketball team is Lauren “Gabby” Moss, a guard who’s ready to prove herself. A child born to two parents in the military, the freshman has lived in eight different locations over the course of her young life, including Alaska, Texas, Kansas and Virginia. Finally settling down in Atlanta to play basketball at Georgia State, Moss explained what comes with living a lifestyle of constant relocation. Moss’ ability to adapt has certainly aided her with her transition to the college lifestyle, although she is still adjusting to the changes. Since she’s not from the South, Moss claims the biggest adjustment to life in Atlanta has been being away from her family and the different styles that people have. “The accents are very different, and everyone dresses differently,” Moss said with a laugh. Moss attended high school in Alexandria, Va. at T.C. Williams High, a school famous for being the location of where “Remember the Titans” was filmed. “There was a lot of school pride there, and it was very diverse,” she said. She has played basketball since she was 10 years old, expressing her confidence in her three-point shooting and defense. Moss explains that the longest she has ever lived in one specific location was five years. “The longest I ever lived in one place was when I lived in Jackson City, Kan. It is completely different from living in Virginia and Atlanta. You learn a lot more in a big city, and there are definitely more diverse people that you meet,” Moss said. Moss said that although living in so many locations may seem hard, there are also positives that come out of it as well. “You meet so many more people living in different places, and they help you learn a lot about yourself in return,” Moss said. A business economics major, Moss said she can see herself staying in Atlanta for a while and beginning her career. “I hope to be working at an investment agency sometime in the future, but I’m also interested in multimedia,” Moss said. She enjoys playing basketball now and hopes to continue being involved with the sport, even after she graduates. When asked where her nickname “Gabby” comes from, Moss found it rather amusing. “I guess it’s because I’m known for talking a lot….. You can’t tell?” Moss said, flashing a big smile and laughing. The laughs and positive energy look to be a good sign as the Georgia State women’s basketball team prepares to take the court for the first game of the season Nov. 9 against UCF in Orlando, Fl. The sky is the limit for the team this season, and newcomer Gabby Moss is determined to make an impact on the team, sooner than later.